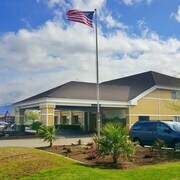 Clean, modern amenities in an older looking motel exterior. Great place to stay while skiing Whitr Pass or exploring Mt Rainier and Gifford Pinchot Nationa Forest. The Tennison Lodge! 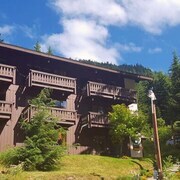 Near Lake Cle-elum and all Your Outdoor Adventures.wifi! Our family had so much fun here! It was very clean and spacious and worked great for our large family. Everything was awesome except small, dated expensi Beautiful Ski area. We had a wonderful “white Christmas.” The room is a short walk to the lifts but is rather dated and small for the price we paid. Service was great; helpful, friendly people. You can stay at a hotel or resort anywhere, but it's not everyday you get to spend your trip in a picturesque Enumclaw lodge. And you can make an even greater case for booking a lodge if you have a group of 10 or more travellers planning to come with you on your excursion to Enumclaw. That way, you won't need to stress over where your posse is vacationing, or waiting on that last person to make reservations before an entire property fills up. When you stay at a lodge in Enumclaw, you'll wake up to the area's natural wonders that will be right at your doorstep. Start your search with us today, and you're sure to find the perfect place for your getaway. Do you already have a lodge in mind? Use Expedia's filters to find the perfect lodge for your upcoming stay. When you book your stay at a lodge in Enumclaw, you will find that there's a great selection of comfortable and spacious properties, along with a wide variety of things to do in the area. It's an experience you won't soon forget and an opportunity to share in the heritage that all visitors get to see in Enumclaw. Don't just book your stay at any old place, especially when you can get a lodge with us for your group, and for a steal. When you stay in a lodge in Enumclaw, you're not just close, you're there! You're going to be amazed by how close you are to the incredible scenery right outside your bedroom window. What are you waiting for? Get ready to join us for a trip to relax in rustic surroundings that you will not find anywhere else.